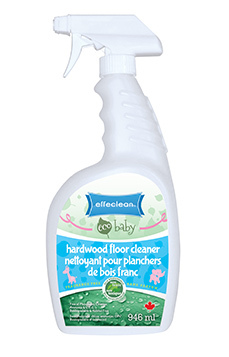 Effeclean Canada Inc. is proud to offer a new generation of safe cleaning products for babies, based on environmentally friendly cleaning agents derived from naturally occurring vegetable oils and fats such as coconuts, plus renewable agricultural resources such as corn, soybeans and sugar cane. Safe to use, safe for babies, safe for the environment. Read our reviews here to see what our customers are saying! With a new baby at home, everything seems like it needs to be clean. Now it’s cleaning time, with a bucket, cloth and cleaning products you’re ready! However, most parents don’t weigh the trade off between toxic cleaning products and the baby’s health; some cleaning products are so dangerous that it can permanently harm a baby’s eyes, breathing and more. Voc’s in a home can cause headaches to adults, think about what they can do to a baby with less developed senses and weaker immune systems! Habitual changes: choosing safer cleaning products such as Effeclean Ecobaby line of products that is safe to use in the home and safe for the environment is the best protection you can provide to your new baby! A baby’s eyes are under developed in the first year, some household cleaners can emit a fume, fragrance or voc which can cause irritation to a baby’s eyes including redness and watering! A baby’s skin is very sensitive to some cleaning products and they can even cause skin irritation. As a parent, it is your responsibility to educate yourself on protection your family and home from the dangers of toxic household cleaners. It’s safer to clean when your kinds are not in the same room and always store cleaning products where kids cannot get at it. When you make that first change to safe cleaning products for babies, you will miss that fresh smell of clean, that smell was just chemically produce. Real clean does not have a fragrance, pine or lemons, you get the idea. Switching to eco cleaning products have real health benefits for your kids, now and in the future. Founder and managing CEO of Effeclean Canada Inc., Shyaan Boodoo, is from the Southern Caribbean and a dad of a little 5 year old girl and a handsome 11 year old guy. In 2009, Shyaan wanted a career change and his shopping experiences in Canada pushed him to make a difference in an area of business he was passionate about. Shyaan launched Effeclean as a direct response to the market need for pure and clean eco cleaning products – the way nature intended them to be.